The Adastra Fleet c.1946. Dragonfly VH-AAD is flanked by two Ansons. Note that the Anson on the right is fitted with Oxford cowls for improved cooling. This may date the photo as early as January 1946. It is believed that the Anson on the left is VH-AGO which retains the original helmet cowls. After successful trials, the fitment of Oxford cowls became a mandatory requirement for all Australian Ansons. UPDATE 29DEC03: The caption was amended on 29DEC03 as the Ansons were originally thought to be VH-AGO (left) and VH-AGG (right). This was based on the notion that only VH-AGO had oval cabin windows. UPDATE 07MAY05: The caption was amended again on 07MAY05 with the emergence of a photo of VH-AGG with oval cabin windows! This feature was originally thought to be unique to VH-AGO but there is now no doubt that both AGG and AGO had oval cabin windows. Closer examination of the original scan of this print reveals that both Ansons in this photo do have oval cabin windows. Therefore, the original caption supplied with this photo is probably correct i.e. VH-AGO on the left and VH-AGG on the right. UPDATE 27AUG05: This same photograph appears in Tom Carpenter's photo album and thankfully it bears a caption on the reverse! The caption reads: "In Ballarat early 1946, our second Anson en route to Tasmania, called in at Ballarat to have its engine cowls changed to Oxford types." 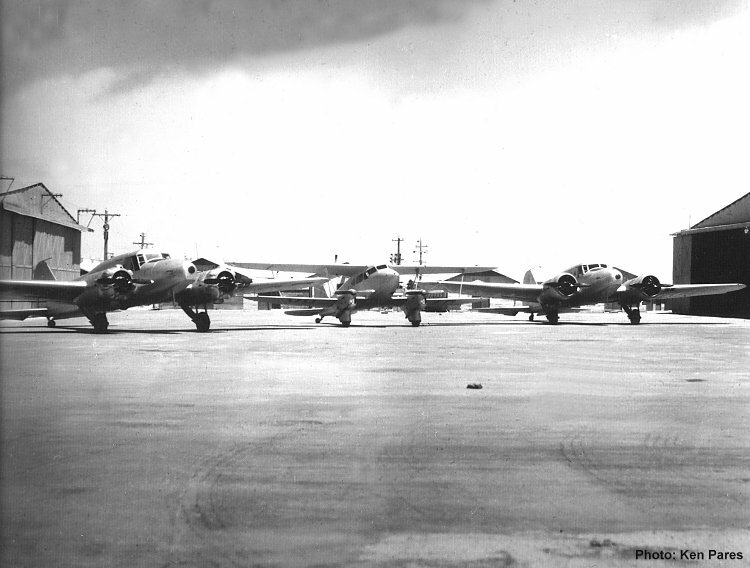 Therefore, this confirms that the aeroplanes are as follow (from left to right) Anson VH-AGO, Dragonfly VH-AAD, Anson VH-AGG.